My friend Cam, of Culinary Adventures with Camilla, sent me two boxes filled with books. I took one of them, Blessed are the Cheesemakers, on vacation with me last month. I read this novel on the flight home, people were looking at me as if I were a weirdo. I laughed out loud numerous times during this touching story about family (the good and the bad), love and learning to trust again. I didn't always laugh. I cried during this novel as well. Sometimes both in the same chapter. This novel tells the story of June, a woman who fled a loveless childhood into the arms of a man incapable of love. She finally flees that marriage and ends up returning to her Grandfather's cheese farm in Ireland. Her grandfather has a way of taking in strays. Stray people that is. People who are, normally young, unmarried, pregnant women with nowhere else to go. However, occasionally, a stray man is sheltered. Such is the case with Kit, who is fleeing a past that he could only deal with by turning to drugs and alcohol. 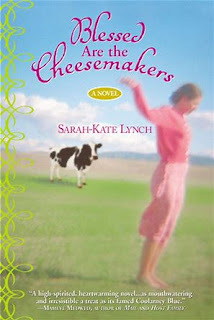 Kit and June learn to be cheesemakers and in the process learn to love themselves and others once again. 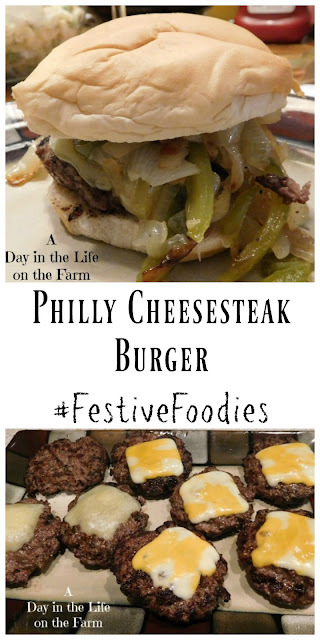 As luck would have it, when I returned home and started working on my blogging calendar, I saw that Cam is also hosting #National Cheese Day with our #FestiveFoodies group today. I knew that I wanted to share this novel when I shared my recipe for this event. Another great thing that happened was the day before I left a package arrived from one of the sponsors for #BurgerMonth, Cabot Creamery. Cabot sent this cheese just as a Thank You for my participation in #BurgerWeek. I was not required nor expected to use it in a blog post but the theme here was too perfect not to mention it. All opinions are strictly my own. So I decided to share a cheeseburger recipe for today's event. But not just any cheeseburger. I decided to combine everything I love about a Philly Cheesesteak and put it on a burger. I sautéed up these peppers and onions to add to the burgers. I used sharp cheddar on my burger. Frank, John, Kirsten and Kirsten's Mom used Colby Jack and our Little Miss had her cheese slices on the side instead of on the burger. This was a delicious burger. I guess Philly Cheesesteak purists may take umbrage at the fact that I used cheese slices instead of that squirt on pasteurized cheese blend but since I am the chef I get to make the rules. I thought the Extra Sharp Cheddar was perfect and I heard no complaints from the Colby Jack camp either. You will find links to the other Cheese Creations at the bottom of this post. I am also linking this recipe to those found at Foodies Read. Many bloggers who love to read, eat and cook link up each month to share what they are reading and creating. I have gotten some great recommendations from this group. All the flavors you love in a Philly Cheesesteak in Hamburger form. Heat gas grill to high heat. Form the burger into eight 1/4 lb. patties. Season with Montreal Steak Seasoning or your favorite seasoning. Set aside. Place the oil. onions and green pepper in a cast iron skillet. Season with salt and pepper. Place onto the hot grill and close the lid. Cook, stirring occasionally for about 10 minutes. Place the burgers on the other side of the grill. Close the lid and cook about 4 minutes on the first side. Flip the burgers. Stir the veggies. Close the lid and cook for another 4-6 minutes until your desired temperature. Stir the veggies, add cheese slices to the burgers, close the lid and turn off heat. Let burgers remain in hot grill for about 1 minute, until the cheese melts. Remove the burgers to a platter and transfer the onions and peppers to a bowl. Place each burger on a bun and top with the peppers and onions. This recipe adapted from one found on the Cabot Creamery Website. These burgers look delicious, Wendy! Talk about serendipitious. Book, vacation, #NationalCheeseDay, and Cabot?!? Love it. And these burgers look amazing, Wendy. Thanks Cam and thanks for the novel. I enjoyed it. Your burgers look delicious! I had a similar one last night at a local steakhouse, with caramelized onions, bbq sauce, cheddar, and a few other things on a very thick burger. MMMM. Thanks Mae, they were very good. Combining two of my favorite sandwiches into one sounds like a great idea to me! Yum! This burgers look so juicy, yum! I always love a good burger and I know I'd love the pepper and onion on these! Peppers and Onions make everything better. This is such a touching story. You never know what is going on in people's lives. P.S. your burger sounds amazing. Cheese cures everything. Cheese does make life much better. Both the book and the recipe sound amazing! Always looking for ways to change up burgers since we eat them so much. They were both wonderful Jolene and I know what you mean. Summertime is burgertime in our household. Both books are sounds good stuff and I love to read and share the recopies with my other friends. I love to read your blog post that give me a huge info about cooking. I will get eBooks download online and after reading the book. I will share with my dear-ones. Thank you, please let me know what you think of it. What a great book, a perfect summer read! Now those burgers, wow, they look delish! That burger sounds like a match made in heaven! The book looks quite good as well. It was Claudia. I think you would enjoy it.